We have a number of SBS based networks serving RDP sessions from dedicated XP Pro SP2 and soon Vista Business RDP boxes. For our clients that need one, two, or maybe three RDP boxes at most, we supply the 1U SR1530 and Xeon 3040 or 3050 integrated with either XP Pro SP2 or Vista Business on the system depending on the client's needs. The cost for a dedicated RDP box is reasonable to about 3 dedicated boxes. When the client needs 4 or more, we look at virtualization on a 2U or 5U/Pedestal depending on load factors. One of the significant changes the 1U chassis has gone through is in the type of fans used to cool the chassis. There are no longer four (4) or more vertically standing fans trying to pull as much air as possible through the chassis. In the SR1400 and earlier chassis, these fans were rather deep, and quite loud. There is one small vertically standing fan on the left hand side of the chassis in front of the DVDROM drive to pull air over to any add-in cards installed. The rest of the cooling is provided by the two horizontally mounted fans about front centre of the chassis. Due to the much larger fan diameter, they are quiet. This is a huge improvement for smaller server closets where things can be somewhat tight, but closet airflow is cooled. When running at their peak, these fans are still significantly quieter than the previous generation of 1U or even 2U Intel chassis. Fan noise is an important factor when planning a client's server installation. Just ask the person who sits in the office opposite to the server closet what they think about all of the noise coming from the closet if there is no HVAC cooling whatsoever going on in there! All in all, these units provide great value for our client's money. 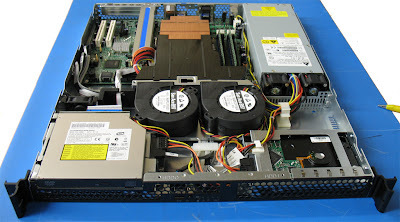 Intel's Server System SR1530AH product page. Windows Home Server CTP - Are you sure?!? SBS and moving Data folders. Easter Weekend Crunch - Busy time for blogging.